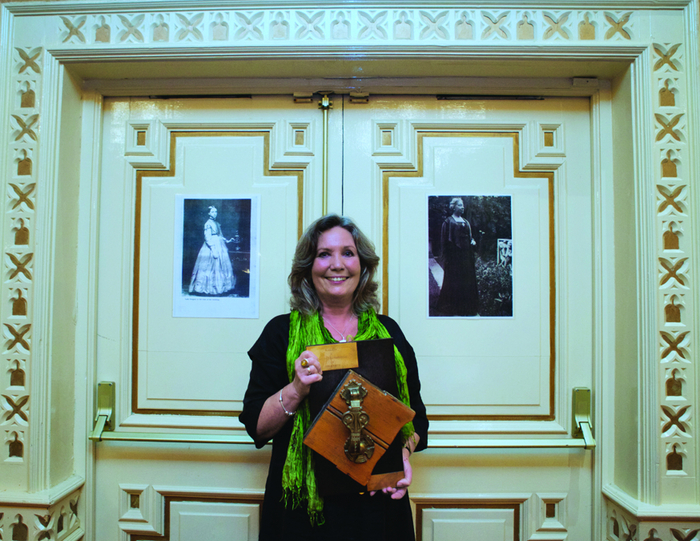 Knock on wood: Nuala Hayes with the Coole door knocker mounted on wood which came from the original door. How many famous people lifted that heavy brass knocker on the door of Lady Augusta Gregory’s home at Coole, Co Galway, and gave it a resounding rat- a -tat -tat? It resounded again last weekend with all the authority of a grumpy judge’s gavel. The writer and broadcaster John Quinn, chairman of the 19th Autumn Gathering, used it to great effect to keep speakers to their time, and to summon people to the next event. The knocker, which has been in the care of the family of actor Nuala Hayes, has been offered to hang in Coole once again. Following the death of Lady Gregory in 1932 the house fell into semi ruin. Its furniture and effects were auctioned off. The knocker was bought by Galwayman Frank Curran in 1940 for £1. He later presented it to the Abbey Theatre, where it hung in its greenroom. It was lost in the Abbey fire of 1951, but some years later reappeared in the Hayes’ home in Dublin where it remained at the top of its stairs. Now following the death of both her parents, Ms Hayes has offered to return the knocker to its historic place. There was no messing about! William Butler Yeats, and his brother Jack B Yeats certainly lifted and rat-a-tatted the heavy brass knocker on many occasions. So did George Bernard Shaw, John Millington Synge, Augustus John, and many, many, others. I am sure everyone had their own style of knocking. Some with more confidence than others. It was an intimidating experience for Sean O’Casey. His arrival was closely watched by Lady Gregory’s granddaughters. She had told them that O’Casey would be one of the most talked about Irish playwrights of the century. They were anxious to see him. O’Casey was collected from Gort station by John Diveney in the side-car, and taken to Coole. The grandchildren watched Diveney take out O’Casey’s ‘small case’. They guessed by the look on Diveney’s face that he was disappointed with the man. O’Casey knocked on the door. It was flung open by Marion, who ran Coole for her mistress. She was a stickler for good manners, and punctuality at meal times. She expected a strict code of dress. Anne Gregory later described that when Marion opened the door, and gazed down at O’Casey, the familiar ‘Welcome to Coole’ died on her lips. She let the poor man in in silence. During a busy five days there were walks, tours, exhibitions, lectures and performances in honour of Lady Gregory, which in addition this year included an Autumn Gathering for Women Writers. Professor Angela Bourke told the poignant story of Maeve Brennan who in her short stories in The New Yorker often highlighted the plight of Irish girls in America. Unlike other emigrant groups, such as the Jews who once the men were established in the garment trade, sent home for a suitable bride; and the Italians who arrived in family groups, Irish girls often arrived in America alone, and ended up in domestic service. Dr Eimer O’Connor, art historian, told the story of May Walsh, the politically active wife of artist Seán Keating; while the author and broadcaster Sinead McCoole spoke about the background to the Coole Park audio visual, which can be seen free of charge at the visitors’ centre. Professor Marc Connor, Washington and Lee University, spoke about the effect that her mother’s rejection had on Lady Gregory. Her mother, Frances Barry, regretted that she was not a boy; and when she nearly died as a baby, Lady Gregory later learned that her mother only regretted that her death would have deprived her siblings of a baby to play with. This trauma had its effects on Gregory’s love for her son Robert, and her difficulty accepting his wife Margaret. Finally as Margaret and Robert were constantly away, she had space to adore her grandchildren, who very happily spent most of their childhood at Coole. Professor Meg Harper of UL, teased out some of the difficult occult writings of WB Yeats. At 51 years-of-age, and reeling from yet another rejection of his offer to marry Maude Gonne, his life-long muse, and, in desperation, her young daughter Iseult, he married 25 -years-old Georgie Hyde-Lees. Surprisingly the marriage was a success. Initially though it was a disaster. Yeats felt a total failure. He believed that he had ruined the lives of three women. But dramatically George began to exhibit a talent for ‘automatic writing’, where spirits communicated a complex and esoteric system of characters and history. Yeats was fascinated. This mystical communication continued for three years, and Yeats spent a life-time deciphering their meaning. The gathering was officially opened by Richard Persse, in his own inimitable style. A busy few days followed. A food and crafts market was held in the town’s green on Saturday morning. The Gort Vibes Cinema Club showed Lelia Doolan’s documentary Bernadette. Ms Doolan answered questions from the audience later. Gort library hosted writers and readings, a creative writing workshop with Yvonne Cullen, and a book launch, Spirit of the Burren by Jackie Quelly. Dr Cecily O’Neill, lecturer on drama and arts education, dramatically shared some of Lady Gregory’s ‘Visions and Beliefs in the West of Ireland; while Hedy Gibbons-Lynott recalled her moment of recognition when in the New York Library, she read the letters and personal memos of Lady Gregory preserved in the Berg Collection. Later, she and Geraldine Mills read from Me and Nu - A childhood at Coole, by Anne Gregory. On Sunday evening the Wild Swan Theatre group, consisting of Kate Sherry, Martina Meehan, Ellen Keane, presented a thoughtful production of the one-act play Lady Gregory’s Ingredients, sensitively produced by Marion Cahill Collins. Followed by the Clarenbridge Players who brought the house down with a hilarious presentation of Lady Gregory’s Spreading the News.